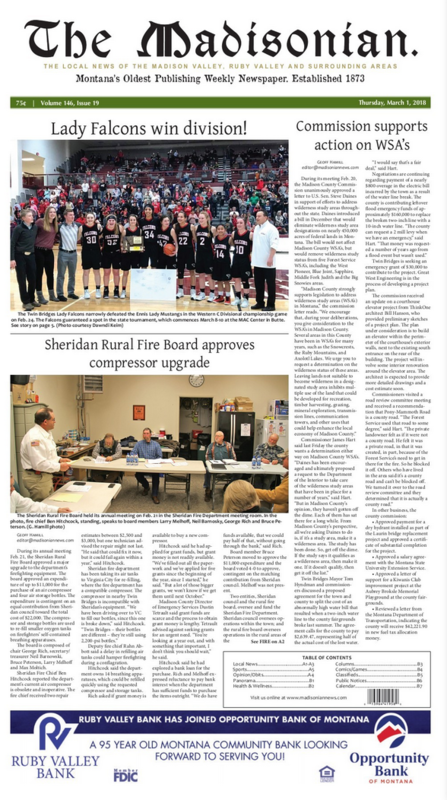 The Gravelly Landscape Collaborative met at the Alder Fire Station on April 23 and received a report from Bureau of Land Management officials on South Tobacco Root watershed projects. An April 17 work session on the Ennis draft zoning ordinance drew close to 30 members of the public. Led by the zoning commission, made up of volunteers Kaye Suzuki and Mark Odegard and town commissioner Lisa Roberts, the intent of the work session was to discuss and work on the first two chapters of the draft ordinance. Virginia City was the winner of this past week-ends 2018 Film-Friendly award at the Governor’s Tourism Conference in Big Sky, MT with the production of The “Ballad of Lefty Brown” which was filmed in the NC Museum ( Montana Heritage Commission) and was the recipient of this years award. HELENA – Lt. Governor Mike Cooney on Monday night joined attendees of the Governor’s Conference on Tourism and Recreation to congratulate finalists and winners of the 2018 Montana Tourism Awards. A community-minded Alder rancher is the 2018 Ruby Valley Conservation District Stewardship Awardee. Les Gilman will receive the award during an awards banquet at the RoundBarn in Twin Bridges on Saturday. "I'm humbled and delighted that the selection committee and the nominators considered me for it," said Gilman. Tourists will need to take a detour when they walk down the historic Virginia City boardwalk this summer. Part of the boardwalk on the south side of Wallace Street will be blocked due to a potentially hazardous structure. Virginia City Town Council discussed the Zweifel Building during its meeting last Thursday. Twin Bridges Town Council approved two resolutions during last Tuesday's meeting to raise the town's water and sewer rates. The increases are necessary to balance the town's water and sewer accounts and build up a reserve fund for future repairs. The Madison Conservation District has selected Jerry and Jolene Brush and the Jackson Family Ranch as the winners of the 2018 MCD Stewardship Award. The Brushes will accept the award during a banquet at the Round Barn in Twin Bridges on Saturday.